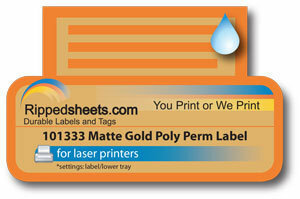 Now made by Rippedsheets.com to order from special components, including the original laser printable topcoat, this 5.0 mil matte gold polyester with an acrylic permanent self adhesive is designed for excellent long term use indoors and outdoors. The Facestock is matte gold that has a coppery look from a distance. The 101333 material is topcoated for Desktop Black and White and Color Laser Printers and resists degradation from scuffing, chemicals and wide temperature fluctuations. The adhesive is a clear acrylic adaptable to many surfaces with a minimum application temperature of 50°F and a service range of -40°F to 302°F. The self adhesive bonds to high and low energy plastic surfaces and slightly oily metals. The adhesive has excellent resistance to chemicals even at high temperatures. 101330 has been laser printed, tested for light abrasion, tested in a weather chamber, and determined to last at least three years outside on a vertical surface. Suitable where exposed indoors to high humidity or occasional exposure to water or lubricating oils.